Lucky Brand Jeans, founded in the city of Vernon, has moved its headquarters to Los Angeles’ downtown arts district. Last month, the jeans maker moved to a new downtown office built in the 1940s art deco style located at 540 S. Santa Fe near the historic 4th and 6th Street Bridges. The new location, which houses their executive offices, finance, product and store design, production, merchandizing, creative services, marketing, and public relations units, is less than five miles away from its original Alcoa Avenue location in Vernon. The company first opened in 1990 producing high-end, vintage-style jeans, as well as a line of apparel, shoes, accessories and jewelry for men and women. Mayor Antonio Villaraigosa along with other officials from Los Angeles celebrated the move Wednesday. 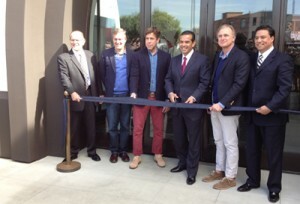 “I am thrilled to welcome Lucky Brand to the ‘Creative Capital of the World,’ said Villaraigosa, whose staff worked closely with the company on its move from Vernon. “We are serious about attracting employers to Los Angeles and cutting the red tape that too often has kept them away in the past. That is what today is all about, creating a healthier environment for job creation in LA,” he added. In 2011, Los Angeles opened a new case management department that assigns managers to guide each business through the process of moving or opening their business to the city. In the past, companies were required to contact seven different city departments. Lucky Brand joins other companies, including Google, Coda and Belkin, that recently relocated to Los Angeles. City officials also say the move could provide a boost for the downtown Arts District, which has recently seen other signs of life with the opening of new hotels and the Ross Department store in the historic Woolworth’s building. “Lucky Brand should be commended for bringing jobs and services to the Arts District, Downtown and the whole Los Angeles region,” said Councilmember José Huizar. The downtown population that has grown from 10,000 to 50,000 people, with 500,000 people a day coming to work in the area, according to Huizar spokesman Rick Coca, who said the jeans company is a “great fit” for the area. “It’s going to be a shot in the arm to the Arts District. You’ll start seeing other similar types of businesses coming into the area. There is a younger demographic… even the employees, most of them are young people who are going to enjoy what the Arts District has to offer, whether it’s going out to lunch, the night life or artistically,” he said. February 23, 2012 Copyright © 2012 Eastern Group Publications, Inc.